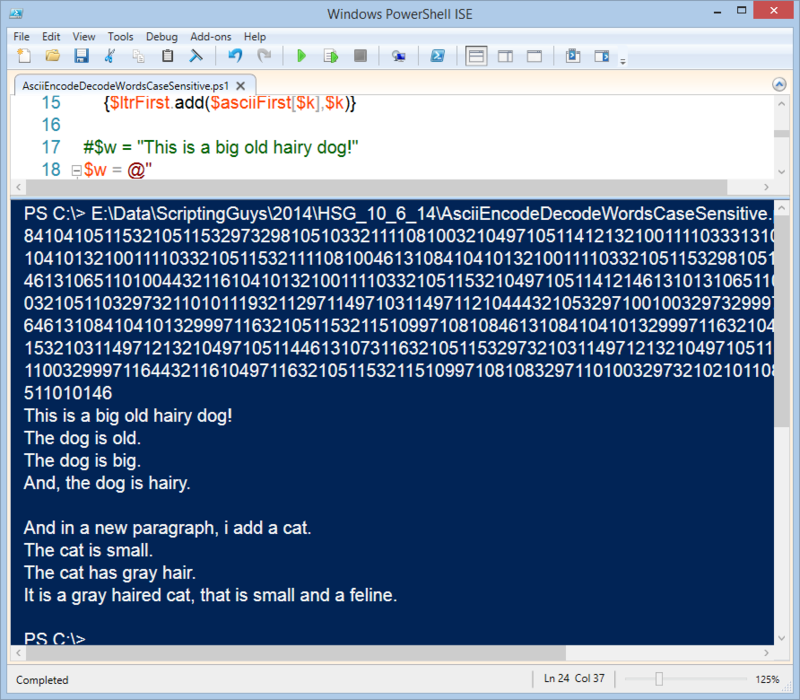 Summary: Microsoft Scripting Guy, Ed Wilson, talks about extending his ASCII encode/decode Windows PowerShell script. Anyway, what have I learned from playing around with hash tables and doing a simple ASCII lookup and replace? Note This is an extension of my previous posts on the subject. 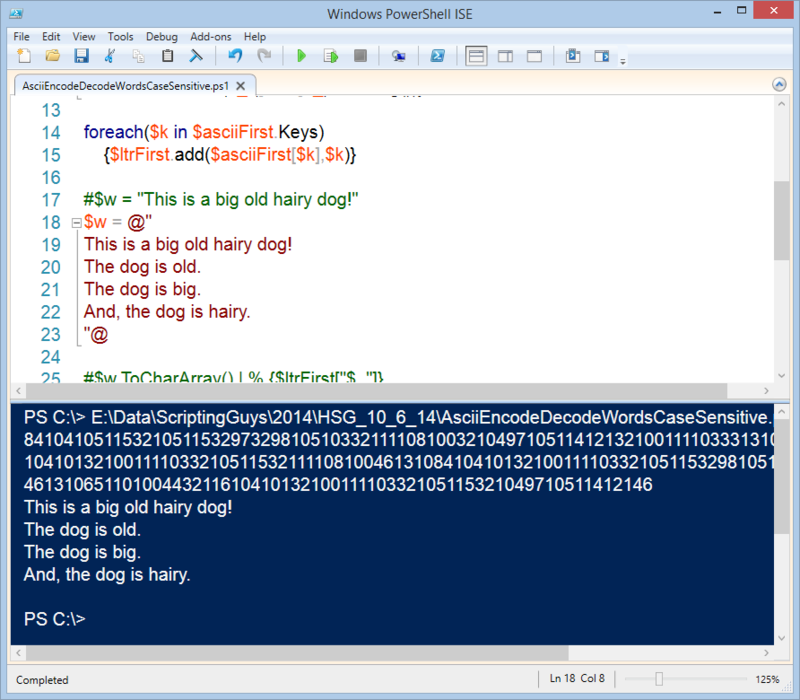 Before you read today's post, you should read Automatically Create Hash Tables and Reverse Values and Converting Words to ASCII Numbers and Back with PowerShell. How to copy hash tables, and to reverse the keys and values from one hash table so that the values of one become the keys of the other and vice versa. How there are limitations on an ordered dictionary. How to cast between [char] and string. How I cannot use a string to look up a [char] in a hash table. How to break up a word in to a series of [char] types, and how to put them back together when I am finished manipulating them. How to use one hash table to look up a value and another hash table (based on the first, but with reversed key and value assignments) to quickly decode a value from that lookup table. All of these become useful tidbits in my arsenal of Windows PowerShell knowledge and techniques. Thus far, I can encode and decode a single word. Now I want to be able to encode and decode several words (a sentence, for example)—and if possible, a paragraph or even two paragraphs. When I first thought about this, I thought, "I will need to add the uppercase letters in addition to the lowercase letters. I will also need to add some punctuation. In addition, the white space might be a problem." Bummer. But it makes sense. This is two separate commands, and only the first range was assigned. But then, I thought a little more, "Hmmmm, the ASCII table automatically contains all the punctuation, uppercase letters, lowercase letters, and numbers, in addition to other things that I don’t need. But hey, it will be easier to just grab the whole thing." While I am cleaning up stuff, I also add an output to see the numbers on a line. So the only output will be a line of numbers and a line of characters. Instead of displaying a single word, I want to see what happens when I input an entire line of text. I also want to try uppercase and lowercase letters. $w = "This is a big old hairy dog!" The error message states that the key has already been added. In fact, this same error message appears over and over again. So, I look at my $ltrFirst hash table, and it seems that a whole bunch of stuff did not get added. To be clear, many of the items from the ASCII table are non-printing characters, so I would expect to see some blank spaces. But closer examination tells me that none of the capital letters were added. It then dawns on me that most of Windows PowerShell is case insensitive. I bet the default Windows PowerShell hash table is also case insensitive. This is why none of the capital letters added to the hash table, and why I got so many error messages about duplicate keys—it is a case insensitivity thing. This is a big old hairy dog! And, the dog is hairy. And in a new paragraph, i add a cat. The cat has gray hair. It is a gray haired cat, that is small and a feline. #$w = "This is a big old hairy dog!" That is all there is to using my ASCII encode/decode script. Join me tomorrow when I will talk about adding further functionality to it, such as reading and exporting files.